The summer of 2010 was supposed to have been the ‘Summer of Recovery’, but since that failed the Obama Administration has moved on to Plan B, the ‘Summer of Death and Destruction’. Notice how quickly the Obama Administration changes the topic when its achievements go awry. It’s almost like they thought, “Hey our economic policies are failing, so let’s turn to some controversial international topic to divert attention.” “I know, let’s bomb Libya, and point the finger at other allies.” Or, “Hey Osama’s been laid up in that Pakistani safe house long enough, let’s go over there and shoot him to take attention away from our failed economic policies.” But not so fast, let’s stick to tracking the success or failure of the Obama Administration’s economic policies. We’ll review his international policy mishaps later, when its fruits come to bear. According to the National Bureau of Economic Research, the Great Recession, the longest of any recession since World War II, began in December of 2007 and ended in June of 2009. So where are we today? When the recession ended in June of 2009, the American economy had a total of 130,493,000 jobs, and through the end of last month had a total of 131,028,000. That’s an increase of 535,000 jobs over the last 22 months, or average growth of just 24,318 jobs per month since the ‘recovery’ began. It can also be said that the economy has added 768,000 jobs since December of 2010, when the “Tax Relief, Unemployment Insurance Reauthorization, and Job Creation Act of 2010” was signed into law on December 17, 2010. In effect, an average of 192,000 jobs per month have been added since Conservatives won back the House of Representatives, effectively derailing the Obama Administration’s failed economic policies. Analytically, any and all jobs growth realized by the American economy since the end of the great recession has come since the December 2010 legislation was signed into law. Thus, all of the Obama Administration’s efforts prior to December of 2010 amount to nothing more than a waste of time and trillions of dollars in deficit-financed government spending. All the jobs growth added since the end of the Great Recession can be attributed directly to conservative economic policies. But we’re not quite out of the woods. Looking backwards, the American economy had a total of 131,660,000 jobs at the end of April of 2000, versus 131,028,000 in April of 2011. 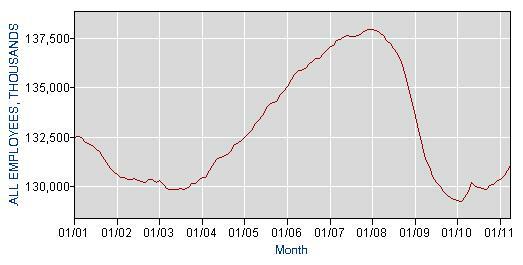 Thus, Americans currently have 632,000 fewer jobs than we had eleven years ago. In addition, since the number of jobs peaked at 137,996,000 in January of 2008 (a record high), we are currently 6,968,000 jobs shy of the pre-recession level. Under the conservative growth rate of 192,000 jobs per month, the jobs market would recover to pre-recession levels within 36 months; while under the Obama Administration’s growth rate of 24,318 jobs per month, recovery would take 24 years. With the U.S. population growing at an annual rate of 1%, or by roughly 3 million per year, you can see that we have a long way to go. To conclude, conservative economic policies are at least on the right track, although they need to be ratcheted up. Meanwhile the Obama Administration has in effect admitted its domestic economic policy failures and has resorted to bombing a former third-world ally into oblivion. It’s a good diversion, but it won’t win the ill-advised Obama a second term. It’s time to finish the job. It’s time to send Obama packing.